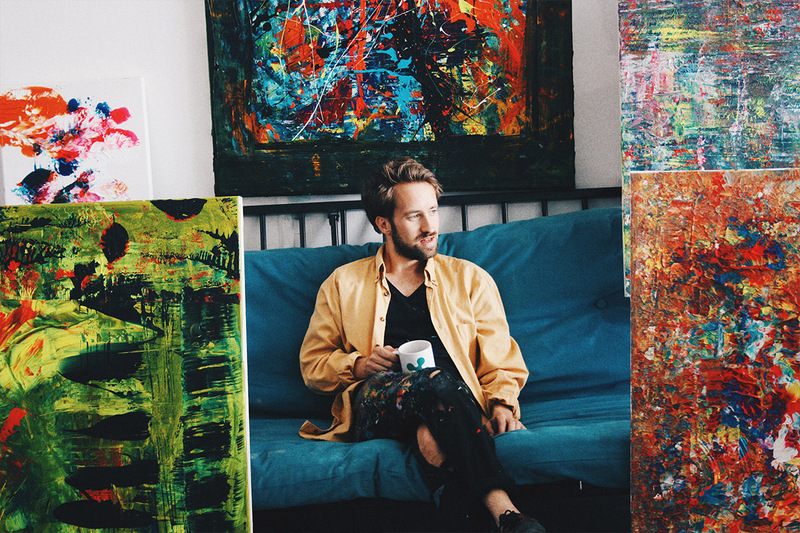 Alexander Rhys is bringing the abstract expressionist movement back with a bang, his vibrant canvasses explode with colour and invite us to delve deeper into his psyche. His style captures the autonomous, spontaneous strokes of his predecessors, whilst managing to change it up for new audiences. Alexander deliberately leaves his works unvarnished, leaving a raw finish to his pieces. He studied Fine Art after dabbling in photography, but the rigid and controlled nature of academic study caused him to break away and find his own path. 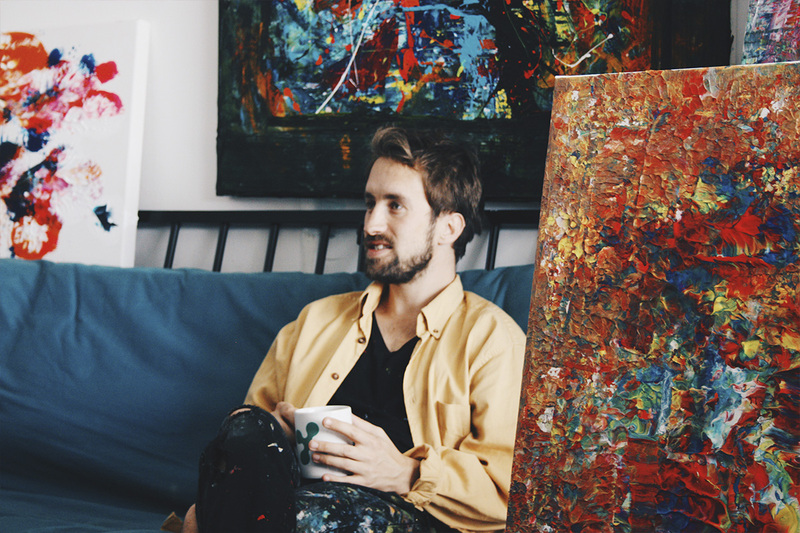 Despite being an emerging artist Alexander has exhibited across the globe and is currently supported by the Prince’s Trust. Alexander now has a sense of who he is and where he fits into the system, even if that means not being a part of it at all. 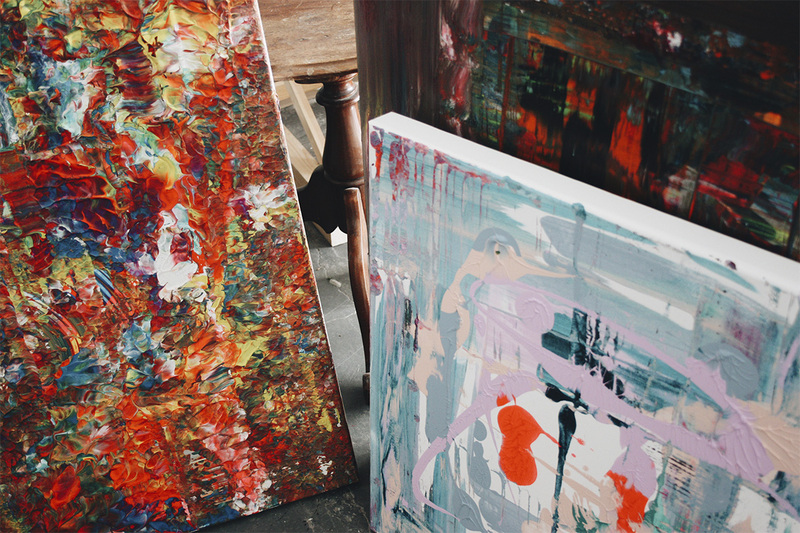 We visited Alexander’s studio in Minerva Works, Digbeth to drink cider and get an exclusive sneak peek of his latest collection. We spoke to him about how his mental health affects his works, life-saving decisions and current projects. My work has many inspirations. As I studied photography before BA Fine Art, I see constant links between the two. I attempt to use the aspects of composing an image or creating a structure that I have learnt when shooting with my camera in paintings. University was great; learning about different ideas, concepts and history of art but after a while, I became so bothered if my art ticked this box or that, I just did what I wanted! Surely art is about freedom after all. I also have a couple of mental health issues that make me see everyday banal things like ashtrays or abandoned objects in a way that reveals their own beauty and narrative. How does your OCD (obsessive-compulsive disorder) affect your work? Painting for me is a sort of therapy. When I paint I don’t feel anything! 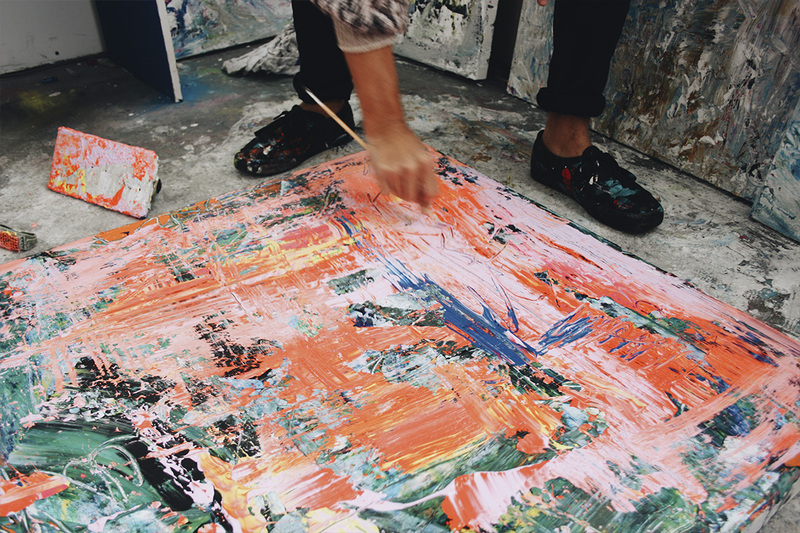 It’s all spontaneous movements and just being at one with the canvas. I could get really pretentious and say all my anxiety and subconscious thoughts get released onto the canvas and that they are self-portraits, but everything we do is a self-portrait anyway. So you don’t have specific meanings that go with your paintings, they are more about evoking a certain feeling, left up to the viewer to decide? No concepts – just look at one of my pieces, if you like it you like it if you don’t you don’t. It’s all about that initial visual impact. I had enough of making up things and trying to justify why I put a colour or marking somewhere when I was at University. I’ve stopped going to art galleries now as you spend more time reading the concepts and idea of the piece rather than looking at the piece itself. You worked with the Prince’s Trust, how did that come about? I have to be honest, the Prince’s Trust saved my life. I always felt a bit misunderstood and the only thing I have ever been half good at is art. I am so grateful that they see my passion and enthusiasm for art – it really hit me when they gave me funding as I finally had the opportunity to do what I love. I get to see my mentor every couple of weeks and he’s been great! I have also sold some work to outdoor advertising company Clear Channel for their new HQ in London through the Prince’s Trust. My work is now hanging in their boardroom and I had the opportunity to have a tour around their building and meet members of their team. It was a great day. 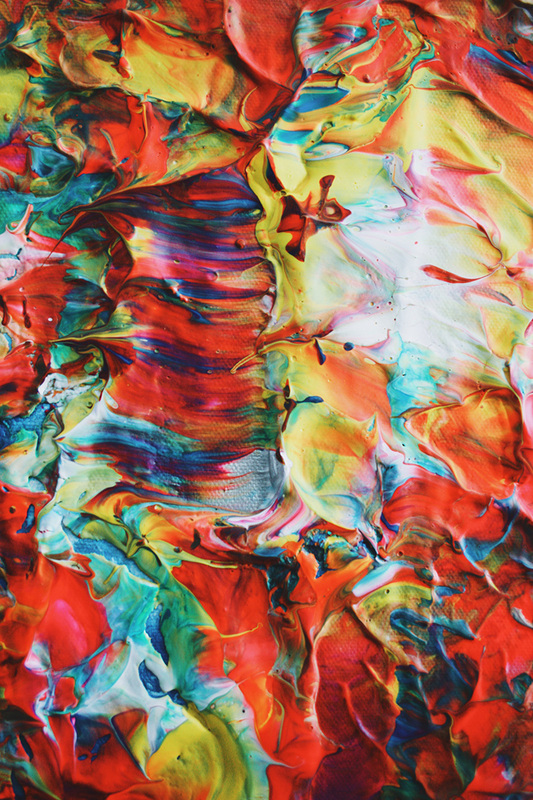 I am currently working on a series of paintings that are full of expressive. I went through a phase of trying to use a minimal colour palette and I was thinking too much about where I should place or arrange the colour around the canvas – I felt trapped doing this as painting for me is all about expression. Expect lots of colour and lots of gestures. I have sold pieces and had work published in Chicago, London, Berlin and Amsterdam etc. but recently I have really tried to bring it back home, as I feel that Birmingham has so much to offer. I’m actually in conversation with a couple of quirky places in Birmingham to have some exhibitions. I got offered to exhibit in Egypt the other week! Unfortunately, I had to turn down this opportunity due to other commitments. And finally, what do you love most about Birmingham? Birmingham is such a diverse place with people from all over the world, wonderful smells and food and the different languages you can hear as you walk through town make me proud to be from the area. As an artist it is great to have all of these different influences around me, I could never lose inspiration living here in Brum. I have a studio in Digbeth and spend a lot of time wandering around the backstreets armed with my camera – you never know what you are going to find.